Who doesn’t love a good sale? I especially love after-christmas-sales, but I don’t tend to brave the crowds the day after Christmas. I wait a day or two (or 5 or 9) and see what might happen to be left over, missed by the mad rush to get the best goods. Sometimes I find treasures, sometimes not. 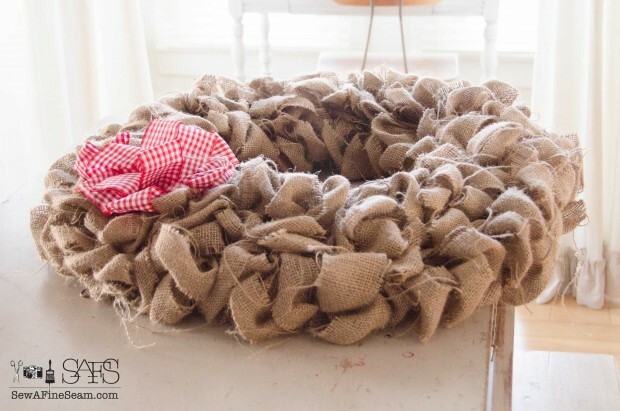 This past after-christmas-season, I was at Lowe’s and they still had several large burlap wreaths left, marked 70% off. I got this large beauty for $5. 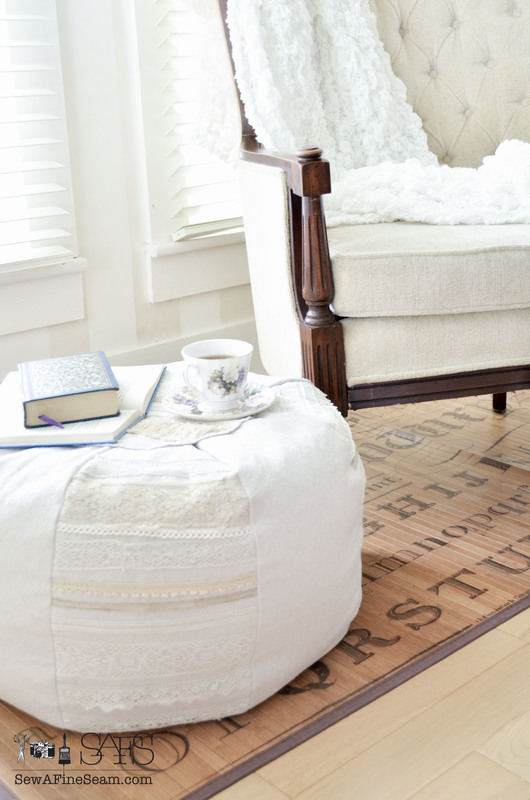 I stashed it in my workroom to create something fun, and this is what I came up with. Bits of this and that, some favorite things, and a hint of bling. 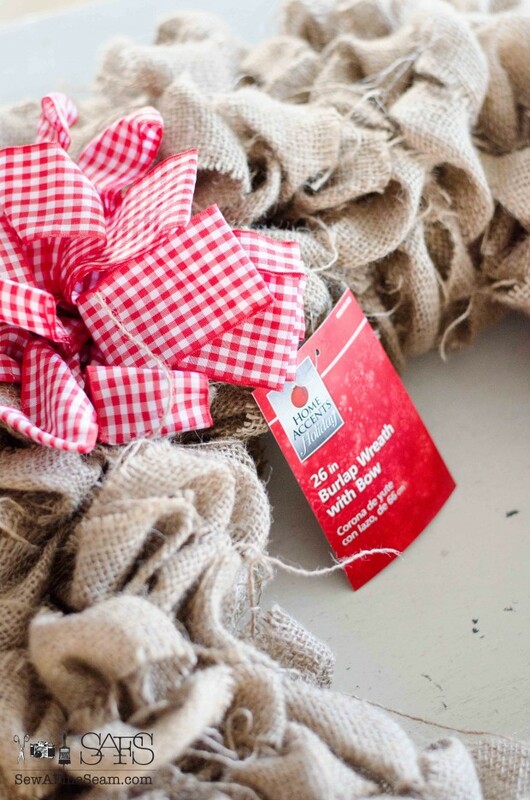 The wreath came with a big red checked bow on it. I promptly removed the bow and fluffed the burlap into the empty space and determined to add something to the spot to make the wreath uniquely mine. Some bits and pieces I found from sifting through my random piles I can’t seem to let go. 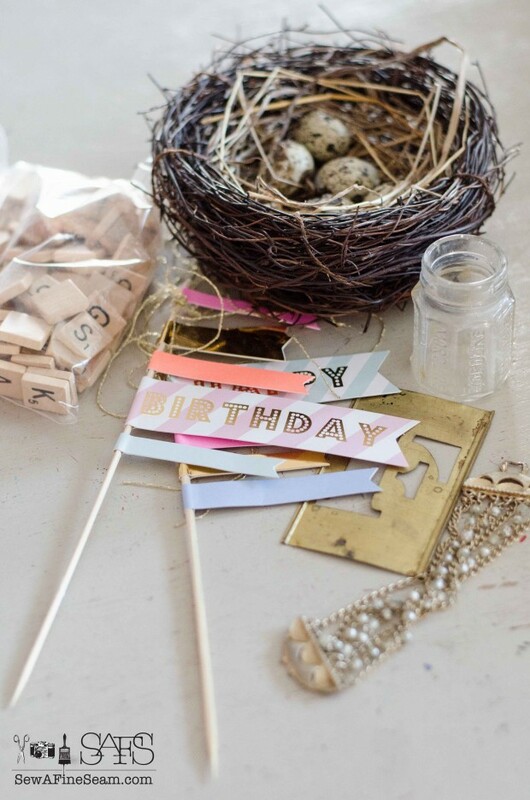 I love paper things, bird nests, bits and pieces. I always have boxes and bags full of stuff to use ‘someday’. 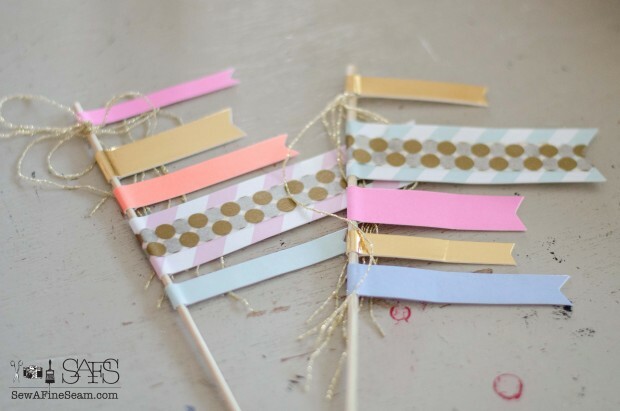 The flag picks were from my youngest daughter’s birthday in November. I used some washi tape to cover the Happy Birthday. Scabble tiles, ribbon and hot glue created a mini banner for the wreath detail. The nest was painted with a bit of sparkly white and gold and the eggs hot glued in place, as was the tiny jar. Hot glue also holds the preserved moss in place, the banner and the vintage stencil too. The jar is filled with some crinkly shred and the picks stuck tightly into the shred. 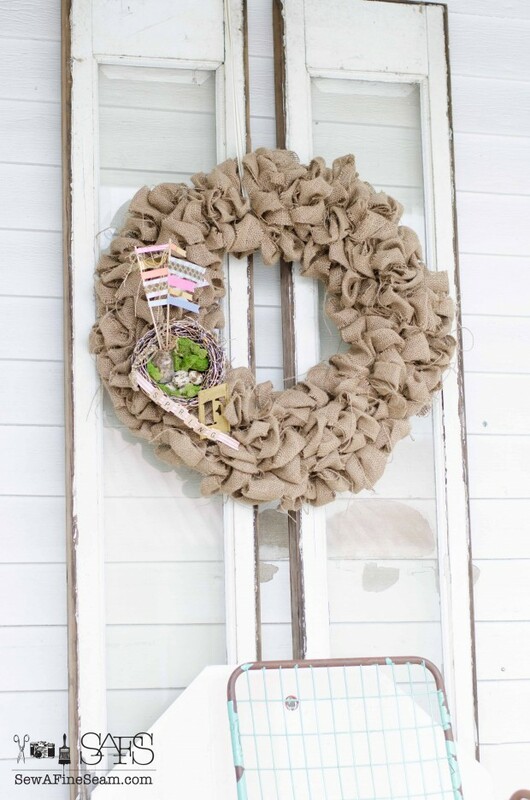 I placed the wreath over the tall old windows I have on our front porch. 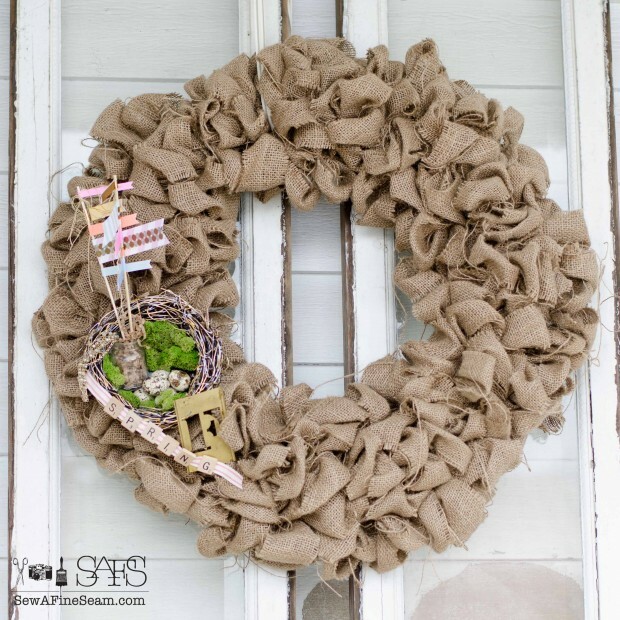 This keeps the wreath back out of most of the rain and weather. I ran a piece of bakers twine through some of the twigs of the nest and tied the nest in place as well as using some hot glue in strategic spots to keep it solid. The bit of bling tucked into the jar and hanging down the side is an old bracelet that was in my Mother’s jewelry box when I was a girl. My daughter ended up with it in her stash when she was digging for stuff to use to create new pieces of jewelry. I nabbed it for this project. It’s quirky and unique but I like it. It has meaning to it. Every time I come home I am reminded of my Mom, my daughter’s birthday party, and the fact that SPRING is coming very soon. Even if we did have snow today. Coming up on Friday – Remember the Monthly Project Challenge I’ve been part of? It’s time for it again! And this time YOU get to link up your projects too! This month our category is Linen and/or Leather. So any new or past projects you have that include either or both of these textiles you can link up right here Friday! Your link will show up on all 6 blogs! 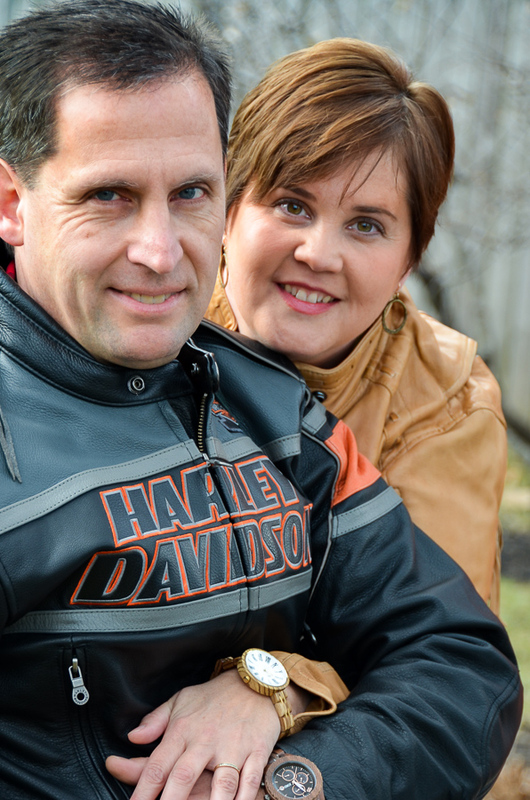 Thanks so much Cheryl Ann! I’m glad it inspires you – it’s fun to do and I love crafting but I know how it gets sometimes – the inspiration just isn’t there. Blessings to you! Again Jill, ingenious and it didn’t cost much money. 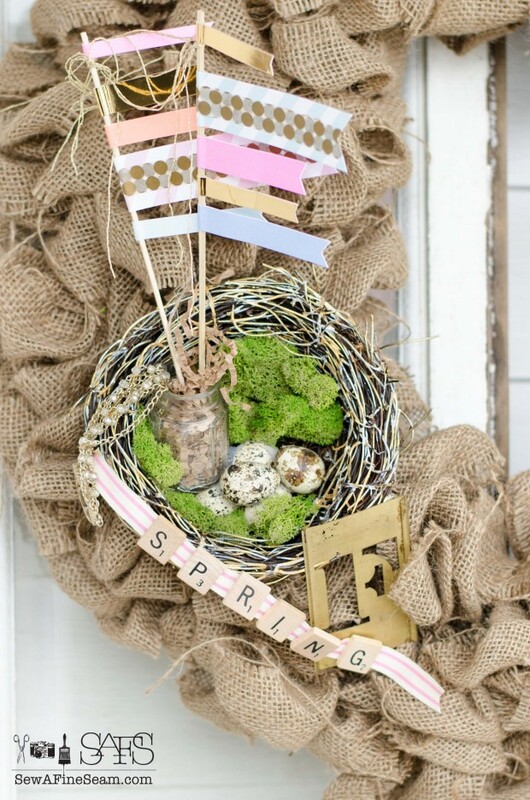 I’ve been looking for a spring wreath to put on my front door & this is a great idea in which I will use. 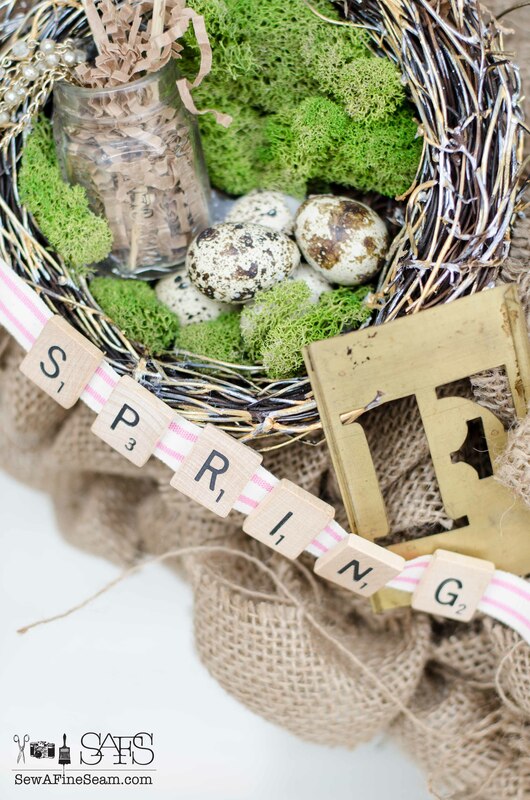 Spring is my absolute favorite season & the daffodils & my other spring bulbs are up. The forsythia are almost bloomed out too. 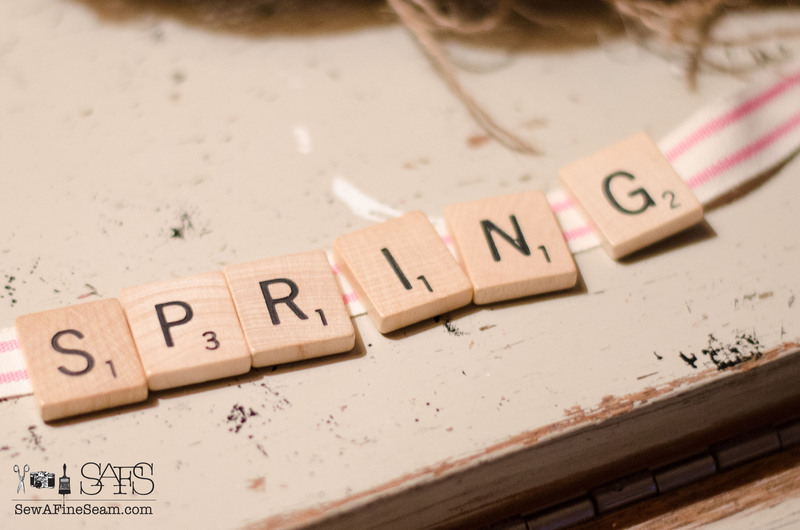 It won’t be long until the azaleas & other flowering trees & plants are in full bloom. This wreath is lovely & so appropriate for the season. Thanks. Oh I love the spring flowers! they haven’t started yet here – in fact we had snow again yesterday 🙁 Hopefully that will be the end of it now! Now that is so awesome Jill, love all little embellies you added, makes it so relaxed looking. I never go to Lowe’s after holidays, maybe I should start huh? What a bargain for $5 when you can do so much with that wreath. 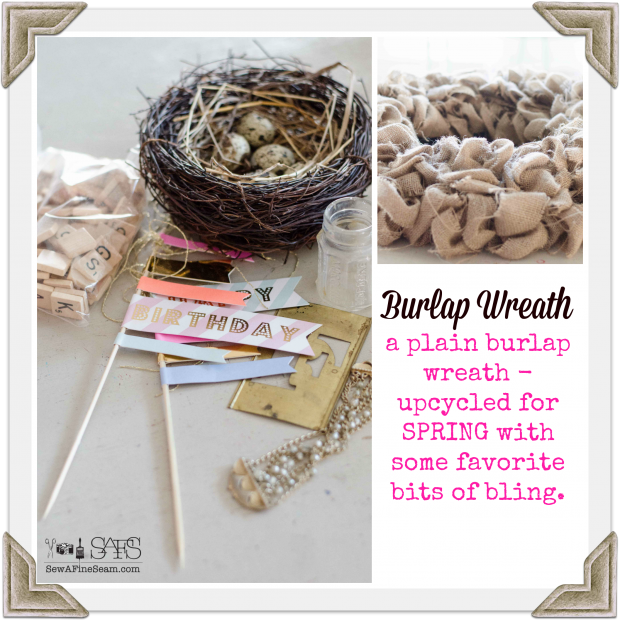 All wonderful little extras you added make your wreath so Springy and perfect for your porch. I’m sure envious of those long windows, perfect for styling. Our internet has been such a pain lately, we have to unplug router to reset almost every durn day to get it to work. Two weeks ago Sunday there was an article in Sunday’s paper about Grand Junction and areas having really poor internet strength and service. No kidding. Still having issues with new pc, why did I want a new pc? Would somebody please kick me for thinking having a windows 8.1 would be better than good old 7? grrreeeeerrr. screech. And yet the providers keep charging for higher speeds and better service. Better leave that subject as it’s caused me so much anguish am ready to throw new pc out windows. You had snow again? Oh heavens, when will you get some Spring weather? We’d have late snow in MT and KY also, very wet and heavy snow. This has been mildest winter for us. Just dreary a lot of the time. 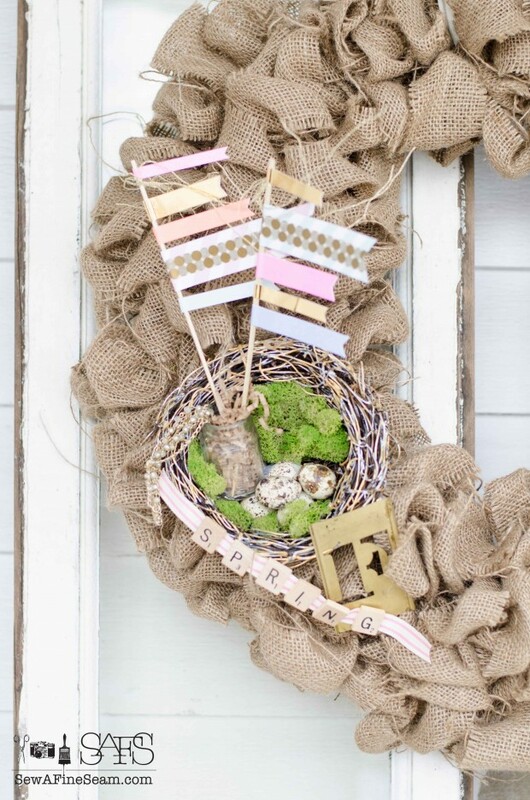 Have great rest of week, what have you been up to besides your wreath? That’s a keeper. Hi JaneEllen! Now that I think about it – maybe it was Home Depot I got that wreath! Either way it was after christmas and it was cheap! never hurts to check but honestly I don’t usually make a special trip the day after Christmas trying to get all the best stuff! I hope your internet straightens intself up. Not fun at all. I’ve had a few times where my internet was down for a few days and it really puts a cramp in my style! I even went to a friends house one time so I could use the wifi to get a blog post done! Thankfully it doesn’t happen often but it does seem our internet service hasn’t been as good as it used to be. Too many people on it now I guess. Oh My GOSH Jill! This is ever so stinkin’ darling!!!! It makes me look so forward to spring. Thank you for sharing such an inspirational project! That is such a fun find for $5! Woohoo! Oh, I remember the bracelet. So, so fun!! 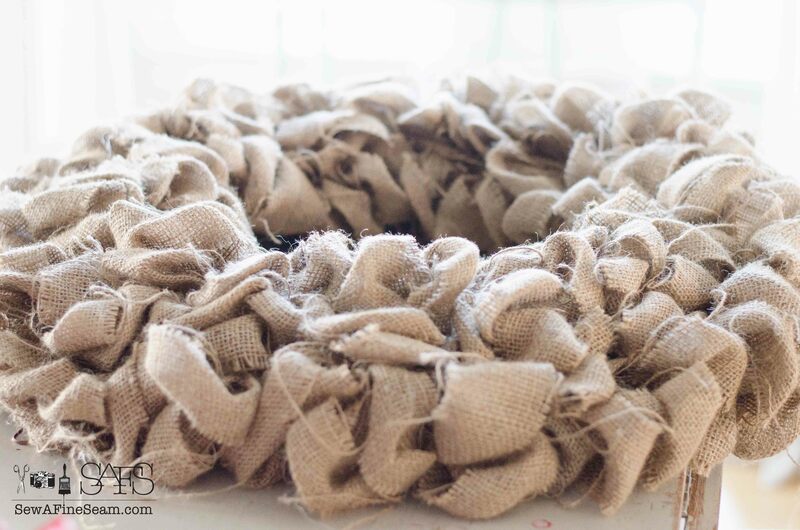 The wreath is darling. I really like using things that have a special meaning.